A couple months ago in my Another Way column I wrote about expecting our first grandchild. What I didn’t reveal at that point was that we already knew we were also expecting our second grandchild, but we couldn’t tell anyone yet! Which made for some interesting, complicating times but absolutely thrilling, times two. Now my first born daughter, Michelle spills her beans as an Another Way guest columnist today. 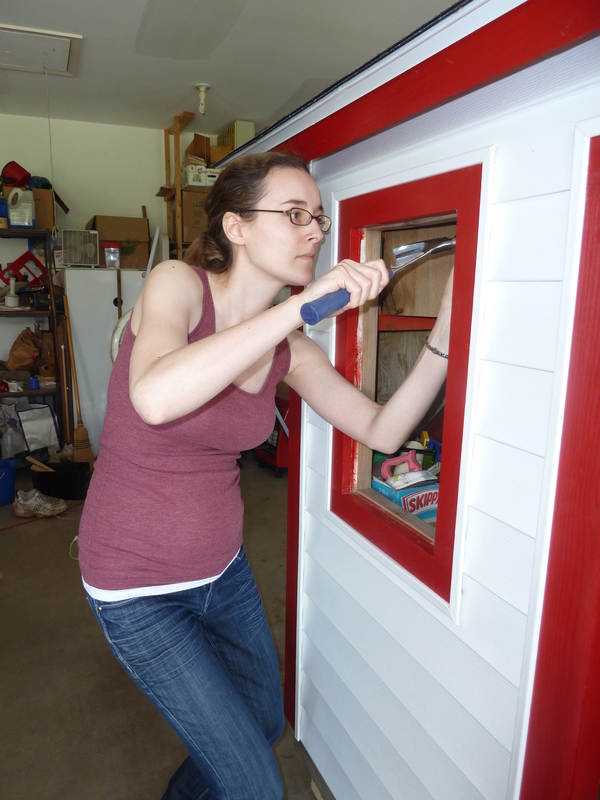 on our playhouse renovation project more exciting! Here you’ll get the Grandma side of the story. When Tanya told us that she and Jon were expecting and I leaped into the air, my eyes immediately shot to my oldest daughter, Michelle, for her reaction. There was joy and surprise there for sure, but also a little quizzical glimmer across her face. I tried to read it, but soon dismissed it. So Michelle wouldn’t be “first” with something: she’s a grown woman, she can handle it, I thought in passing. A couple weeks later at Easter when my husband and I were with Michelle and Brian and his mother, brother, and two of their dear friends, Michelle and Brian revealed their own wonderful surprise: they were expecting too! But it was so early (they hadn’t been to the doctor yet) that they didn’t want to even tell our other daughters who were not able to come home at Easter. Brian said something to his mother about “getting ready to babysit” and as the news sunk in, I was swept away with emotion, especially since Brian’s father had so recently died (last November) and that grief was so fresh. We all hugged, wiped tears and were excited and elated. So every time I talked to or emailed Tanya and Doreen, I had to stifle or edit myself to not leak anything about Michelle and Brian’s news. Tough for a mom, especially one who has been known to let Christmas or birthday secrets slip. I managed to hold my tongue and finally when it was official from the doctor, Michelle was able to tell her sisters. I couldn’t resist bragging that I had been able to keep it from the sisters. But still Michelle and Brian didn’t want the news to go further: no social media, no columns. There were employers to inform, tests they wanted to wait for. I couldn’t tell my family. But I was talking to Mom one night when I was really tired. I had left a message for her and she had called me back so I was kind of mindlessly yakking on about this and that. Michelle’s mother-in-law had called me earlier in the evening about a minor car accident Michelle had had so that was on my mind and I happened to mention it to my mom and then like a dummy went on to say the concern was whether it might have hurt the baby at all. I just plowed right on and then two sentences later, confused, my mother interrupted and said, “Well Michelle isn’t pregnant!” It was a statement, not a question. And I thought, oh no, now what do I do? Lie to my mother? Fib? Flub around? So I just said, “Oh I must be tired and mixed up” and thankfully she left it at that! I still call my children by the wrong names sometimes, so why wouldn’t I get my stories mixed up? So, so much for a braggy mom keeping secrets. But now it is official and we are filled with even more joy (there’s always room for more joy, more love) which I learned long ago when we were expecting our own second child. Like many others, I wondered, how will I ever love another baby? How can I steal from the closeness I feel with my child and add another to our family? 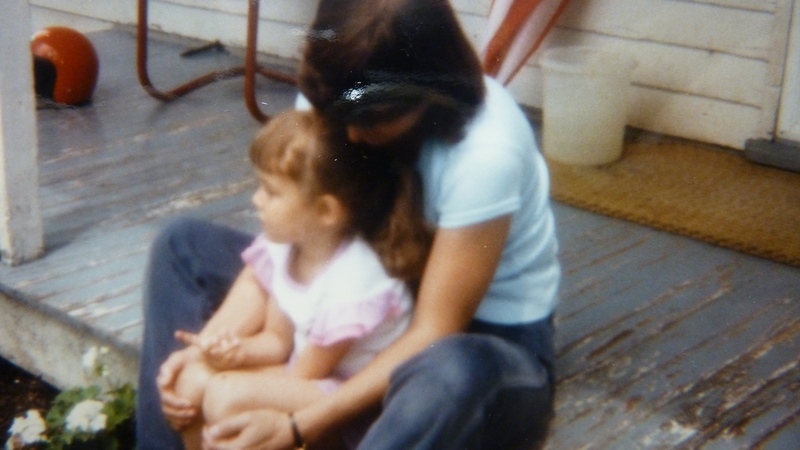 many years ago on the babysitter’s front porch. If you are fortunate enough to have more than one child, you know the answer to that question. There is always more love for more, no matter what order they come in.And I never want to take any child for granted. Each one is a special special gift. 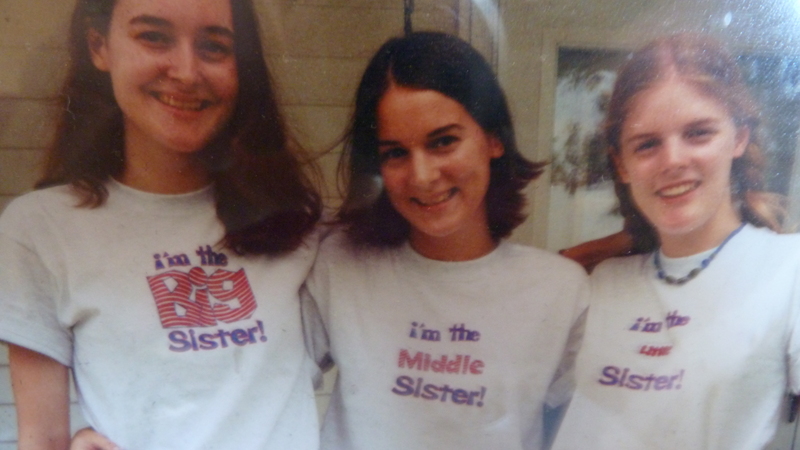 The three sisters with T-shirts from the Shipshewana Flea Market, about 12 years ago.